My bookstore takes a pretty simple approach to Bibles– we only sell the major translations, and we try not to get too gimmicky. With all our minimalist-ness, we still have six or seven different study Bibles. Imagine the selection at Lifeway! 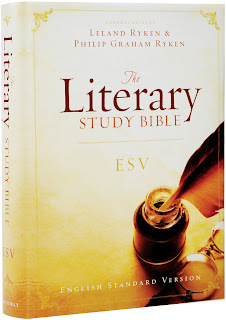 So yes, there are probably at least 100 different study Bibles out there, and another one came out last week: Crossway’s ESV Literary Study Bible, edited by a father-son team, Drs. Leland and Philip Ryken. The Rykens are well-qualified for this project– the father is a literature professor at Wheaton and the son is the pastor of the historic Tenth Presbyterian Church in Philadelphia. They bring technical skill and a devotion both to the infallibility and the beauty of Scripture. The idea here is that the traditional study Bible is basically a reference book about the Bible– it has cross references, comments on most verses, explanation of background material, charts and maps, etc. These are helpful for study, but not in terms of actually sitting down to read the text of the Bible– in fact, all the bells and whistles make it difficult to read a longer unit of the text. So the design of the Literary Study Bible is to highlight the text itself. It is printed in a single column, with only the verse numbers thrown in and with wide margins for notes. Each book has an introduction that gives an overview of the genre and subject matter and gives hints for reading the book, and there are brief notes at the beginning of sections showing how what follows fits in to the book as a whole. So, for example, the introduction to 1 John cautions us not to look for a single line of argument, but shows how the seemingly unrelated paragraphs actually contribute to John’s overall purpose. If you use a study Bible in personal devotions or in preparation for teaching, this one would be a good one to use as a companion to one with a more traditional approach. It will not exhaustively explain Paul’s doctrine of election or give you exciting charts of different interpretations of Revelation. But it gives a great road map of each book, and it helps us guard against reading the Bible like a collection of unrelated verses, rather than the beautiful, unified work of literature that it is. Its less-is-more approach highlights the text of the Bible itself, making it great for daily reading with a little help along the way. Maybe most importantly, the editors are able to show the literary features of the text while affirming its entire truthfulness. We have to see both if we are to marvel at God’s Word as we should. Shameless plug: On sale at the RTS Charlotte Bookstore for $29.99– 40% off the list price!